New look, same great program! 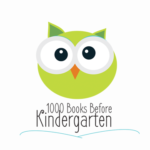 Consider participating in our 1000 Books Before Kindergarten program and get your preschooler on the road to literacy and readiness for Kindergarten. While reading 1000 books sounds daunting, it’s only 3 books a day for 1 year (1095 books), 10 books a week for 2 years (1040 books), or 1 book a day for 3 years (1095 books). Read more about how the program works.